When he was 20, he moved to Rome where he attended film school "Professione Cinema" and started to work as assistant director for many Italian films and popular TV series. After seven years of working on other people's sets, he felt ready to embark on his own projects. Together with the Italian-Israeli director Dalia Castel, he made his first two documentaries: "In the Bubble" and "Good Times" that won awards in 15 different International Film Festivals. In 2005 he attended the Berlinale Talent Campus and than moved to Berlin (Germany) after winning the Nipkow Programm Fellowship, a scholarship for media professionals. Since 2007 he have directed five documentaries for the program 360¡ GEO that airs on "ARTE" and its produced by Medienkontor GmbH. Today he works on commissioned projects for television an creative documentaries as "La Deustche Vita" and "Following Casey". Studies Urban Sociology at the Humboldt University in Berlin and Film Production and Screenplay at the International School of Film at New York University. Since 2006 Tania has been a freelance journalist based in Berlin for RAI TV, Globo News, newspapers and online magazines. At the same time she cultivates her passion for cinema, working as International Sales Assistant at festivals such as Cannes, Venice and Berlin for the sales company Studio City Pictures. 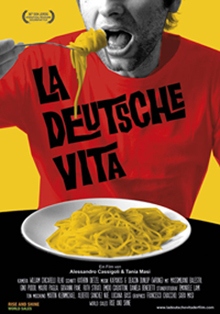 "La Deutsche Vita" is her first feature documentary.